CUTS - EXIST 2. Vinyl EP. Bleep. Dropping concurrently with its sister release EXIST 1, this EP from composer Anthony Tombling Jr. aka CUTS contains four tracks of cathartic, brutalised experimental electronica. Born out of Tombling experiencing sleep paralysis following a car crash in 2012, these numbers push through trauma to find something enlightening. Of course, this means darkness and tension are never far off in Tombling’s music. 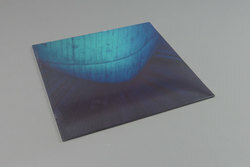 Dense, distorted keyboard and synths characterise Exist 2 in a manner that recalls Oneohtrix Point Never and The Acid. The way that the tracks seek to conquer personal pain with storms of electronics is also reminiscent of Portishead’s excellent Third.